An Ideal Way to Welcome in Spring in Chicago's North Shore! Are you looking for a great way to welcome in Spring in Chicago’s North Shore? 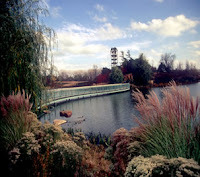 Look no further than the Chicago Botanical Garden nestled in the North Shore town of Glencoe. With 385 acres and 23 meticulous and lush gardens, this atmosphere shows off the beauty and wonder of every plant and flower imaginable. You’ll get a jump start on enjoying the sites of the season and will find exploring new foliage can transport you to exotic destinations. Currently this North Shore attraction is hosting an exhibition entitled Losing Paradise? Endangered Plants Here and Around the World which will run through this coming Sunday, April 4. 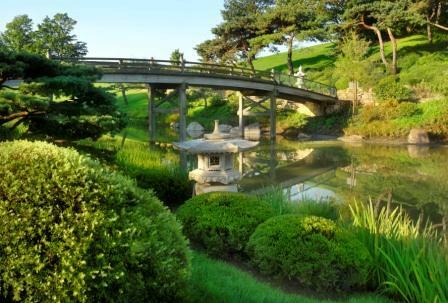 Celebrating its ten year anniversary, the Chicago Botanical Garden will host an Antiques and Garden Fair taking place April 16-18 which highlights the best in classical and contemporary garden furnishings, botanical art, and home and garden design from more than 100 exhibitors from the United States and Europe. Whether or not you take advantage of this area gem, the Chicago North Shore is still considered one of the most desirable locals in the Chicago area. Homes are rich in character and style and neighborhoods offer charm and comfort. If you are looking to move to the North Shore, please feel free to contact me with any questions you may have or to see some of the beautiful properties offered. I look forward to hearing from you! You may not be thinking about moving from your North Shore home anytime soon, but it’s always good to stay up to date on what is selling a home in today’s market. Perhaps you know that in a few years you may consider upgrading to a different home in the desirable North Shore area so you may want to begin the process of getting your home ready to sell. Below are 10 must-have features buyers are looking for in their new North Shore home according to a recent survey by Avid Ratings Co.
Again, now is a great time to start any home improvements even if selling is not a current consideration. If you are hoping to sell soon, please feel free to contact me with any questions you may have! I would love to help you through the home selling process from start to finish! Looking for a Home in Chicago's North Shore? The Chicago North Shore area is an amazing place to live with endless things to do, arts and culture, not to mention close proximity to Chicago’s downtown! If you are hoping to dive into the North Shore Real Estate market; I’d love to answer any questions you may have! After living in the North Shore for over 25 years; I am very familiar with each unique area and can you find a home and neighborhood that fits your needs and lifestyle! Please feel free to take a peak at some of the stunning homes that are currently on the market in Chicago’s North Shore. Again, I’m always ready to help in any way I can- contact me today! Rejuvinate Your North Shore Home for Spring! Spring in Chicago’s North Shore is right around the corner as we see temperatures rising and winter’s white blanket slowly melting away. It’s an exciting time as we begin to take in hints of the fresh air of the coming season. You may be thinking of all the things you want to do with your North Shore home to give it that rejuvenated look that will carry through the warmer months. One of the best ways to dig into Spring is through prepping for this year’s garden. Even if you’ve never planted a garden before, below are ten easy steps to get you on the right track and your North Shore home will have a refreshed look in no time! 1. Survey the Yard- Make note of tree limbs that should be removed. Rake mulch from beds planted with bulbs before foliage appears, and refresh mulch in other planting areas after soil warms. Check fences, steps, and pathways for disrepair caused by freezing and thawing. 2. Order Tools and Plants- Take note of tools that are missing or broken, and order tools for the new growing season. Choose new plants for the garden and order perennials, trees, and shrubs for spring planting. 3. Get Ready to Mow- Send the mower or leaf blower in for repair if needed. Refill the mower with oil and make sure all parts are in working order. Clear the lawn of winter debris, and look for areas that need reseeding before mowing. 4. Prune Trees and Shrubs- Remove dead, damaged, and diseased branches from woody plants. Prune cold-damaged wood after plants resume spring growth. Prune spring-blooming shrubs and trees after flowering. 5. Take a Soil Test- Check soil pH with a home soil- test kit, taking several samples from different planting areas for an accurate reading. Enrich soil as necessary. 6. Prepare New Beds- Clear the planting area as soon as soil can be worked, removing sod or weeds and debris. Spread a 4-inch layer of compost or well-rotted manure and any amendments over soil, and cultivate it to a depth of 10 to 12 inches with a spading fork. 7. 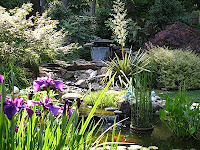 Plant- Plant bare-root trees, shrubs, and perennials such as hostas and daylilies by early spring. Transplant container-grown plants anytime during the growing season except midsummer; be sure to water them thoroughly. Sow seeds of cool-season flowers like sweet peas, poppies, and calendula, and vegetables such as lettuce, parsley, and spinach. 8. Fertilize- Apply balanced fertilizer or other soil amendments recommended by soil-test results around trees and shrubs when new growth appears. Begin fertilizing perennials when active growth resumes. 9. Start a Compost Pile- Begin by collecting plant debris and leaves raked up from the garden. Chop these up first to speed decomposition. Turn regularly. Continue adding to the pile throughout the season for rich, homemade compost next spring. 10. Clean Bird Feeders and Baths- Disinfect the feeders and bird baths by scrubbing with weak bleach solution (1/4 cup bleach: 2 gallons warm water). Rinse and dry before refilling them. Clean birdbaths and feeders regularly throughout the season and change birdbath water once a week. Read the full article. I hope these tips are helpful as you begin to welcome in spring in the North Shore! It’s a great time of year so be sure to get a jump start on this season. If you have any questions about the Chicago’s North Shore Real Estate market; please let me know! I look forward to talking with you! Arts and Culture in Chicago's North Shore! One of the many benefits in living in Chicago’s North Shore is the endless list of things to do! No matter what your style; it seems that one is never at a loss when it comes to art or entertainment. If you have been searching for something exciting to do that breaks the mold of “the usual”, why not try these events that are taking place this month in the North Shore area! You're invited to a marvelous party! Oh Coward! celebrates one of the theatre's greatest entertainers-Noël Coward-who gave us the beloved works Blithe Spirit, Private Lives and Hay Fever. His effervescent music and charming quips now combine for an unforgettable evening of the most memorable tunes of the 20th century. It's Harlem in the spring of 1943. Elizabeth and Quilly are sisters of a certain age sharing their quiet lives together, but when they take in Husband Witherspoon, a handsome young boarder, their entire world changes abruptly. Husband, fresh from the country and adjusting to life in the big city, is on a desperate search for his missing fiancée, but ends up finding love in the most unlikely of places. Told with heartwarming sincerity, humor and a touch of poetry, The Old Settler paints a poignant picture of two women testing bonds of sisterhood and finding the strength and forgiveness only family can offer. John Mahoney stars in this evocative play about the evolution of friendships in a small Irish town. As Desmond Drumm nears retirement, his memories come to life, reminding him of the triumphs and tragedies of his youth and prompting him to mend relationships with a childhood friend and the love interest that had charmed them both. But as scenes from the past shed light on the misunderstandings of today, Desmond must realize that his lifelong ability to use his great intellect and acerbic wit as a means of self-defense has come at a cost. Prices Vary. Exploring intersections between visual art, literature, and social reform, this exhibition brings together more than 150 objects that reflect the creative vision and collaborative journeys of the Bloomsbury group, a collective of British artists and writers active during the first half of the 20th century. Free. The traveling exhibition, "Losing Paradise? Endangered Plants Here and Around the World," seeks to draw attention to plants that are in danger of disappearing from the planet. Curated by the American Society of Botanical Artists (ASBA) and developed in collaboration with the Smithsonian s National Museum of Natural History and the Center for Plant Conservation, the exhibition will next appear at the New York Botanical Garden. Free Admission (does not include parking fees). With all that Chicago’s North Shore has to offer; it’s no wonder that many are seeking to make it their home! Please let me know if you have any questions about the North Shore real estate market or if you would like to look around at the many gorgeous homes in the area. I’m here to help!